On the 21st of November 2018, Hyundai Motors new hydrogen fuel cell electric bus was put into service on Seoul's regular bus routes in order to begin testing the viability of this new technology. 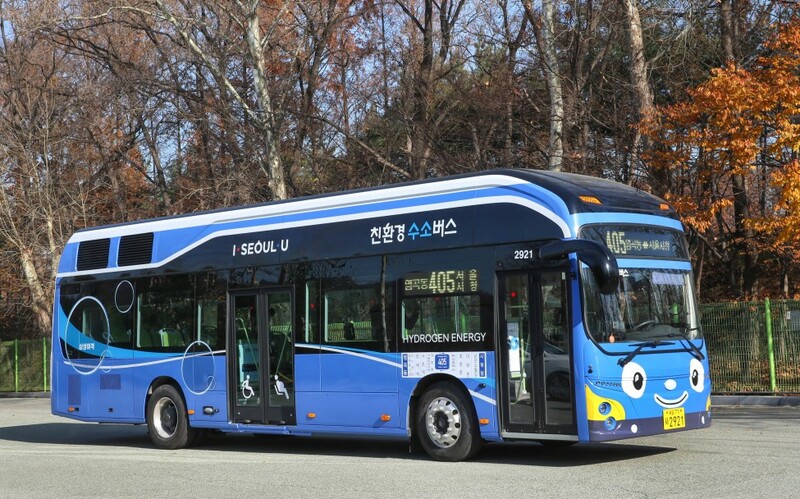 In addition and starting in March of 2019 a total of 30 hydrogen-fuel cell electric buses will be put into service in six cities across the country, including Seoul, Ulsan, Gwangju, Changwon, Seosan and Asan. With the establishment and operation of a hydrogen filling station, 13 major domestic and foreign companies are participating in SPC, which will play a key role in revitalizing the domestic hydrogen economy. The arrival of the era of popularization of pollution-free hydrogen electric vehicles is accelerating. The Ministry of Commerce, Industry and Energy, along with the Ministry of Environment, the Seoul Metropolitan Government and Hyundai Motor Corporation signed an MOU on Wednesday, with the goal of supplying 30 more buses to 6 cities next year, and a thousand hydrogen buses nationwide by the year 2022. In attendance at the MOU signing ceremony were the Minister of Commerce, Industry and Energy, the Minister of Environment, the Minister of Environment and Labor Kim Hak-yong, the Minister of Environment and Labor Kim Jong-ryul, Governor of the economy, Changwon Hur Seongmoon, Assean Osseon, and Seosan Mayor Jang Jung-ho, officials of the government, the National Assembly and local governments also were in attendance. The Hydrogen Energy Network Co., Ltd. (HyNet) will finalize the establishment of the corporation after completing procedures such as the Fair Trade Commission's corporate merger review process, and will enter into full-scale activities. In the future, HyNet will contribute to the construction of a hydrogen charging infrastructure by participating in government subsidy for hydrogen filling station through cooperation with government and local governments. The Korean government also announced in June that it would try to supply a total of 1,000 hydrogen buses by 2022. It will also introduce policies such as the creation of hydrogen electric bus subsidies and the reduction of the hydrogen bus acquisition tax for transportation business.